At 500 PM AST (2100 UTC), the remnants of Beryl were located near latitude 15.2 North, longitude 60.3 West. The remnants are moving toward the west-northwest near 26 mph (42 km/h), and this general motion is expected to continue into Monday. 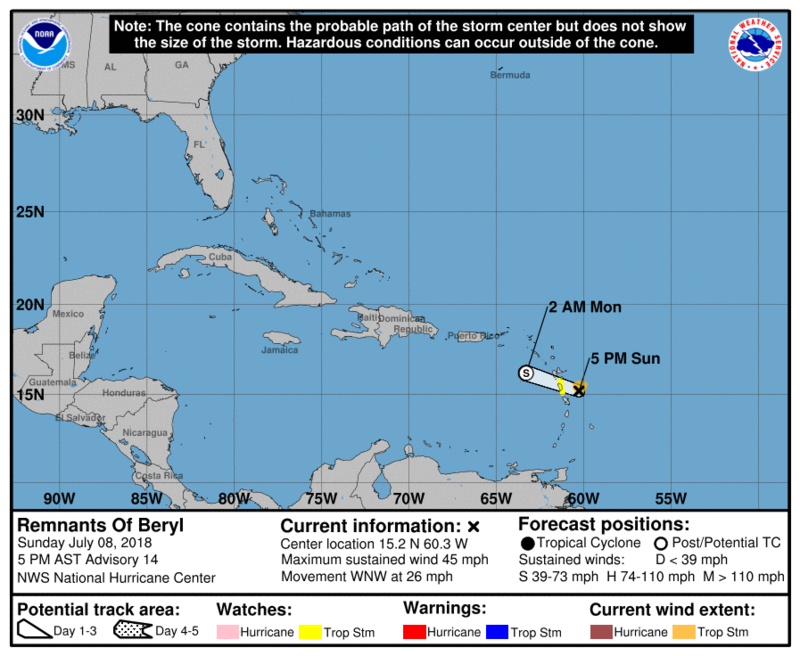 On the forecast track, the remnants of Beryl will move across the Leeward Islands, and move near or south of the Virgin Islands and Puerto Rico on Monday. Maximum sustained winds are near 45 mph (75 km/h) with higher gusts. Slight weakening is anticipated during the next 24 hours. Tropical-storm-force winds extend outward up to 45 miles (75 km), mainly to the north and northeast of the center. The Government of Barbados has replaced the Tropical Storm Warning for Dominica with a Tropical Storm Watch. The other respective governments of the Caribbean area have discontinued the Tropical Storm: Warning for Guadeloupe, and have discontinued the Tropical Storm Watch for Martinique, St. Martin, St. Barthelemy, Saba, St. Maarten, and St. Eustatius. WIND: Tropical storm conditions are possible in Dominica and Guadeloupe tonight. Strong gusty winds are also possible elsewhere across the Leeward Islands tonight, and in the Virgin Islands and Puerto Rico on Monday. RAINFALL: Beryl is expected to produce storm total rain accumulations of 2 to 3 inches through Tuesday across the Leeward and the Virgin Islands, as well as Puerto Rico. Local amounts up to 5 inches are possible.